When you were little did you play in card table tents or forts? I sure did. When I was wandering around the house complaining of being bored on a rainy day, my mom would pull out the old folding table used for card games, throw an old blanket over it, pull out some old pots and pans and hand them to me and tell me to go play house. Something magical seemed to happen when I crawled under the fabric walls. My imagination would let loose and I could happily play for hours. 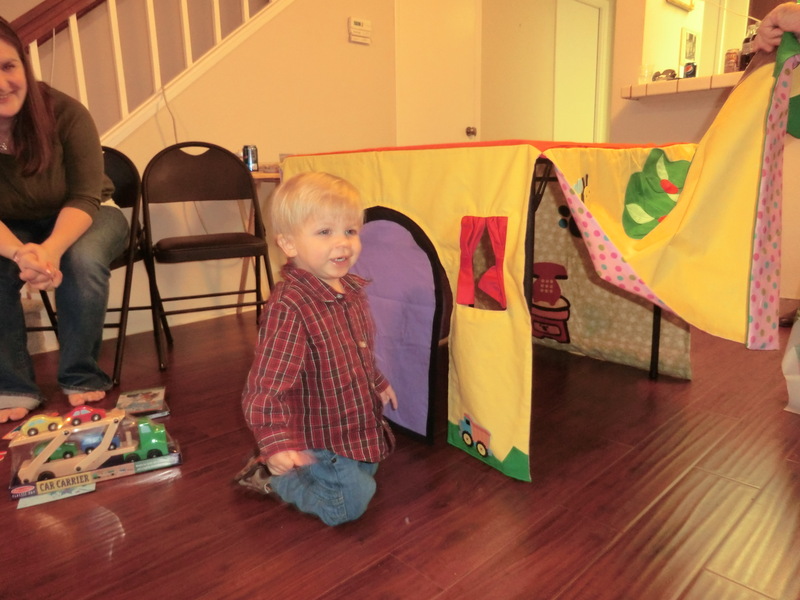 So I’ve decided to create a special card table house / fort for my grandson Davy. Davy loves the old TV show "Blue’s Clues" which was hugely popular here in the U.S. when my kids were little. Nowadays the only place I seem to be able to find it is on Netflix and YouTube. Blue is a dog and she lives in an adorable little yellow house with a red roof with her friend Steve who follows her clues. Last week I headed to the fabric store with my trusty iPad full of photos I found online of the inside and outside of the Blue’s Clues house, and I spent two hours up and down the aisles looking for the closest matching fabrics I could find. Each side of the house is double sided – the outside fabric is the bright yellow and the inside is one that looks like the wall paper in blue’s house. And of course it will have the windows and curtains, and flowers and lizards and frogs on the outside and I even found a little unfinished wooden mailbox at the fabric store that will be transformed into the purple mailbox outside Blue’s house. If Davy has half the fun playing in his Blue’s Clues house as I am having making it then it will be a big success! 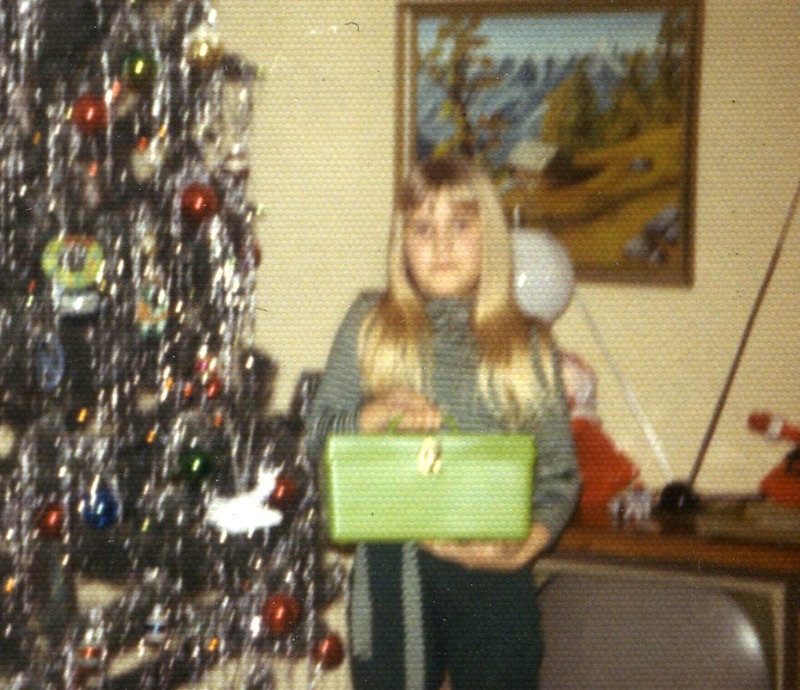 In addition to creating The “Blue’s Clues fort” for Davy’s birthday which is in December, I also still need to come up with Christmas present for the family. Last year I did calendars for everyone in the Cooke family that sported images for events related to each month. This year I’m thinking about framing charts. It’s amazing I haven’t gotten around to this already, but I think it’s about time. My friend Janet Hovorka just happens to own the company Family ChartMasters and she’s going to be here in a day or two for the Family History Expo being held in my area (Northern California) this weekend. So I will be picking her brain and spending a good deal of time on their website. She told me that I have there are loads of new styles of charts to choose from. If you’re looking for Christmas present ideas for the family this year, why not consider a family tree chart? Hopefully you’ve got your genealogy data in a database so you can just export your gedcom and make it gorgeous for a gift they can enjoy for years to come. If you decide you’d like to check out Family ChartMasters– which of course I highly recommend – I’d really appreciate it if you would click the image above to visit their website because when you do you are also supporting this podcast and making it possible for me to keep the free podcast episodes coming. So thank you very much! And by the way, many of you have asked what happened to our Amazon links on the website which were another way that you were helping to support the podcast. Well, Amazon dropped their California affiliate producers because of some recent tax law changes. But I just got an email saying they are reversing that. This is awesome news because I just can’t get through all my Christmas shopping without Amazon, and I know that many of you shop online too. So I’m going to get that reinstated asap – keep an eye out for the Amazon links on the homepage at genealogygems.com and I will also return it to the toolbar. (UPDATE: The Genealogy Gems Toolbar has been discontinued) Thanks for being patient and being such incredible supporters of this little old podcast! Entertainment Weekly website is reporting that Marisa Tomei has just been added to the roster of celebrities who will be featured on the new season of Who Do You Think You Are? here in the US. Joining here are Martin Sheen and actor Blair Underwood. China, Hungary, Mexico and U.S. Records Include Illinois, Maryland, New York and Washington. Ancestry.com announced the release of the 1930 Mexico National Census and it’s free to the public. Ancestry.uk also recently added some new records. Two million railway employment records from the UK National Archives are now available on the site. The free Convict Records website at http://www.convictrecords.com.au is based around the British convict transportation register compiled by the State Library of Queensland - it includes about three-quarters of the 160,000 convicts transported to Australia between 1787 and 1867. The RVA NEWS is reporting that the Virginia Historical Society has launched an online and searchable database called “Unknown No Longer: A Database of Virginia Slave Names.” It’s a free service featuring a sizable portion of the over 8 million records in VHS archives. For a limited time only, RootsMagic is offering a special introductory offer for Personal Historian 2. Through October 31, 2011, Personal Historian 2 is available for a special introductory price of only $19.95, saving $10 off of the regular price. The discount is available only on the Personal Historian website at http://www.personalhistorian.com or by calling 1-800-766-8762. There is a new family history podcast focused on Australian Genealogy called Genies Down Under. You can subscribe to Genies Down Under through iTunes. I think I struck a chord with so many of you out there when I told you in the last episode who I’m hanging in there waiting for my little grandson Davy to call me Grandma. My email box was over flowing with the most wonderful stories of the terms of endearment you use in your family for grandmothers and grandfathers. Maria in Australia: In her family theydistinguish between her mother’s parents and her father’s parents by using their married surnames: Grandma Northcote or Grandfather Walters. “While we've used Grandmother and Grandfather in my family, my uncle was known as "Grand Sir" to his grandchildren. (My aunt is known as Grandmother.) I really must find out how that name evolved and write down the story. “…my husband(‘s family) was much more creative. Two of his grandmothers were named after what kind of road they lived on: one was "Bumpy Road Granny" the other was "Smooth Road Granny". He had another grandmother called "Chicken Granny" because she had chickens running around her yard. And a fourth grandmother was called "Big Ole Granny". She was called that not because of her size but because she was actually the Great-grand mother. 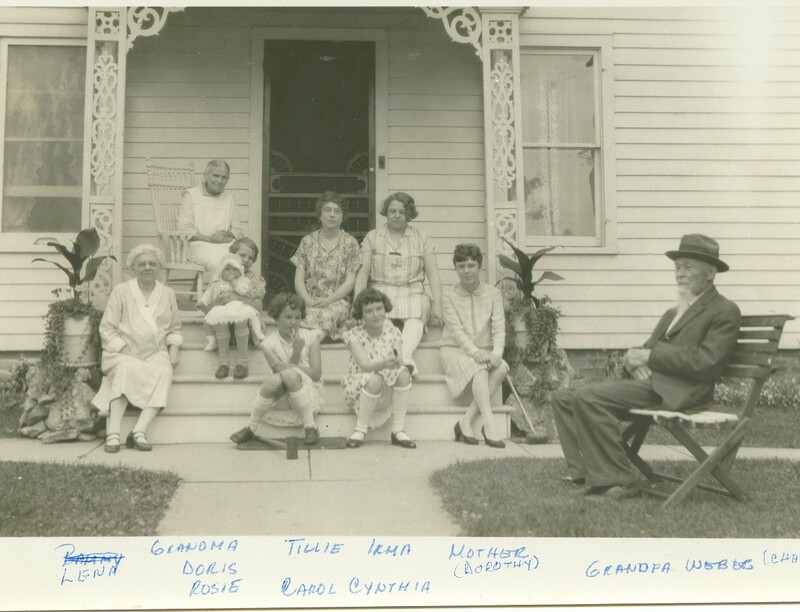 “(This photo) was taken on the front porch of my great grandparents' home in Reeseville, Wisconsin c. 1928. The names were written right on the bottom of the picture, thankfully, and the writer referred to Lena (my great aunt) first as "Bammy" before crossing it out. I always appreciate it when someone writes names on photos, but this one is more appreciated as it reveals the quirky nickname "Bammy" for Grandma. Gotta love it. I just received my "Ultimate Google for Genealogists" Collection from Family Tree Magazine. I can't wait to delve into it & get my "Lisa fix" between podcasts! When my maternal grandparents were alive, they affectionately called each other "Pappy" for some reason. Apparently when I was a toddler, I heard that as "Happy" & that's what my sisters & I called my grandmother for the rest of her life. It was a well-fitting name, too, because she always was happy! My oldest daughter called her grandmothers "Little Grandma" and "Big Grandma" because my mother lived with her mother so that she could remain in her own home! Memories! “I have 3 grandchildren, girl twins, Ryan and Riley who are my son's children and a 2 year old boy, my daughter's son. When the twins were about 16 or 17 months old, Ryan couldn't say the "grr" sound of "Grandma and Grandpa" so she came up with the name "Mo-ma" and when I pointed to my husband and asked "What is his name?". She quickly replied "Mo-pa". Her twin Riley, quickly picked up the name and started to call us "Mo-ma" and "Mo-pa". 3 years later when my grandson arrived he fell into step with his cousins, Ryan and Riley, and has started to call us "Mo-ma" and "Mo-pa". These grandchildren have 3 sets of grandparents: me and my husband; my ex-husband and his wife and my daughter in law's mother and father, who are called "Nanny" and "Pop Pop". “When our son Miles was just starting to talk, he had trouble with the usual consonants so "Grandma" just wouldn't come out no matter how hard he tried. One day when my mother-in-law stopped by he was so excited to see her he just stood in the center of the room, his arms held out as he tried to call her. You could see in his face how hard he was trying. He rose up on his toes, his hands opened wide and he almost began shaking as the word traveled up his body and burst our his mouth.... "HEM-MIE!" Not even close to "Grandma", but it seemed to work for him - seemingly satisfied, that's what he called her from that day on. Little sister Lily has adopted it as well and my mother-in-law couldn't be happier that she has what must be a completely unique name from her grandkids. “I recently listened to your podcast which included your discussion of names given to grandparents. I thought I would share some of the names we used for our grandparents growing up. When I was born, I had 4 living grandparents, and 5 great-grandparents, who were all direct ancestors -- not from second marriages. During my growing-up years, they all lived within 5 miles of my family and we saw them often. So, it was a challenge to uniquely identify each grandparent. There were the usual names, such as Grandma and Grandpa McBride for one set of grandparents, and Grandma and Grandpa LaMonte for a set of great-grandparents. Another set of great grandparents were Granny and Louie. Why we called him by his first name, I don't know -- all of his grandchildren and great-grandchildren called him my his first name. I guess "granny" comes from my Ozark heritage. But there were also a couple unusual names. If someone was just listening to my sister, cousins and me talk, they would hear something like Grandma In-da-green, or Grandma and Grandpa In-da-ellow. When my older sister was quite young (she was the oldest of all the cousins on that side of the family), she identified one of our great-grandmothers as Grandma In The Green House (which, over time, was shortened to Grandma In The Green) and one set of grandparents as Grandma and Grandpa In The Yellow House (which became Grandma and Grandpa In The Yellow). I have not previously included these names in my genealogy data base. But, I have now added these names and stories behind them since I know we used these terms in family letters. It would be good to have notes how these names came about for when future generations are reading these letters so they know who we are talking about. I think that is priceless! Tim really got the message I was hoping to send in bringing this topic up. This is part of your heritage. Take a few moments and get these wonderful terms of endearment and their origins into your family history records and database. You’ll be glad you did! I’m sending out a 1 year premium membership to JT for recording his terrific story, and also to Tim for his Green House and Yellow House Grandparent story. Simply wonderful! And thanks to all of you who took the time to write in. Thanks for being part of this podcast episode. It’s most fun when it truly is a conversation!